I am a normal 65+ woman and decided to write this book so that I could share some of the experiences and adventures I have had throughout my life. The choices I was given, the decisions I made and how I have dealt with the consequences not only to myself but those around me. Life changes due to the choices you make and how you move forward depends on how you deal with those decisions and consequences. 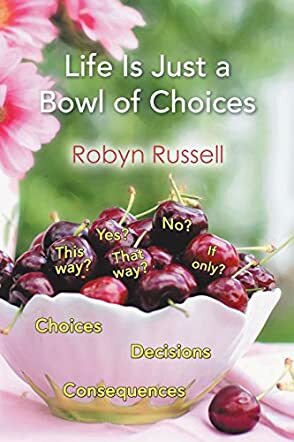 Life Is Just A Bowl Of Choices is an autobiography written by Robyn Russell. What is a life well spent? The author contends that the choices one makes ultimately shape one’s life and, as long as one is still breathing, that life story is continually being shaped and defined. Her own story began in Mombasa, East Africa where her mother moved with her husband, whose family owned a farm there. Her father left her mother when Russell was three months old, and his family forced his wife and children to leave the farm. They moved to Kenya and later to Tanzania. Russell was 10 years old when the family moved to the south coast of England where she’s lived her entire life. Russell had her first child relatively early in life -- she was 18 years old when Ian was born. Her husband is a musician, artist and healer. Russell has pursued a number of professional occupations, most recently working with her husband’s musical group.